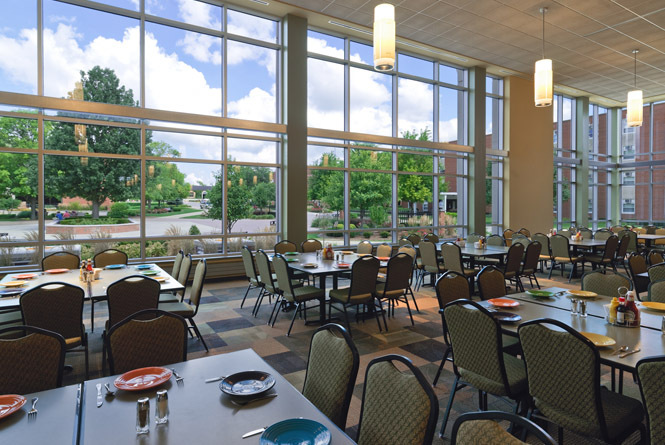 At Olivet, we make health and nutrition a priority. When it comes to food, we provide an extensive variety of healthy and delicious meal options in our 4 on-campus locations and 2 coffee shops. Located in the lower level of Ludwig, Red Room offers a convenient and healthy create your own salad bar. Stop by and design exactly what you are looking for. Casa Del Tigre features a fresh Mexican grill offering create your own burritos, bowls and tacos. Located across from McHie Arena, stay and enjoy your creation at the location or take it to go. A variety of cold items are available in the Nesbitt lobby, for dine in or carry out. Among its comfortable couches and relaxed atmosphere are computers accessible to anyone who wants to surf the Web or check email – perhaps while sipping a latte or a Wet Oreo drink. The coffee shop is a popular hang-out for students and staff alike, and often hosts campus events, such as musical group performances and poetry readings. Starbucks roasts high-quality whole bean coffees. Other premium beverage options include rich espressos, lattes, and Tazo Teas and Starbucks also serves a variety of pastries and confections. Located in the Benner Library and the Perry Center, Jazzman’s offers a variety of hot and cold coffee drinks, as well as fresh baked pastries and cookies. Come sit and relax in this cozy space. For those who are new, or for those who are unsure of their meal plans, there are two basic meal plans from which to choose from: Block Plan or Standard Weekly Plan.